After leaving the dust of The Sahara desert behind me in Mauritania, I made my way to Northern Senegal. I felt that after spending so much time in the sand, I needed to reconnect with the coast, and hopefully some wildlife. So after spending a couple days relaxing on the beach in Saint-Louis, I made my way down the highway to a place called Zebrabar inside Parc National Langue Barberie; home to some of the most varied bird life in the world. Generally speaking, I’m not much of a bird guy. Unless a bird is big enough to attack something or colourful enough to make a good photo I’m not “turn on” by birds like some people are. I’m definitely not one of those guys that goes around counting how many species I’ve seen. 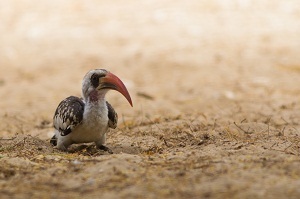 However, West Africa is home to some of the most diverse bird life on the planet, and Parc National Langue Barberie is the epicenter of that “winged-activity.” Each year, thousands of species of birds make a pit-stop in this national park during their great migrations between Europe and Africa. Moreover, there are many other species that are around year round. Although they say the best month to visit the park is November when the highest numbers of birds are in the park, you can find a vast array of colourful birds any time of year. During my 4 day stay in the park I managed to spot pelicans, flamingos, cormorants, hornbills, and a couple dozen other species which I couldn’t identify. Anyways, I’m also not the type of guy who can go on talking about birds for a couple hundred words, so instead I’ll just show off a couple of my shots from the park. Enjoy! Wonderful shots Brendan, my favorite is the bird with the red chest ! You got some great shots, Brendan. I’m not much of a bird guy either, but when they are colourful like that, they really stand out. On my recent trip to Africa I saw enormous flocks of Flamingos. It was just beautiful. Thanks Dean – I like taking pictures of birds… but they don’t get me off like some people haha. I’m with you that birds are not the most interesting animal in the whole wide world, however, that one bird with the long, curved beak is quite unique looking. Did you catch what that type of bird is called? Gina – That’s called a hornbill. I believe that one specifically is called an Orange hornbill. Great photos Brendan. You don’t need to make excuses for liking to see or photograph birds. Real Men like to bird watch 🙂 Forget those muscle heads on the beach with 6 pack abs. Hot women like men with binoculars, zoom lens, and the latest bird identifying app on their iphone (used to be a bird book, but times have changed.